To produce a mighty [blog], you must choose a mighty [Wordpress] theme. It may be a first for me to write a blog post that gushes over a research paper. This is it, but you will have to bear with a bit of storytelling that led to this Astounding Action. During a recent 46 days of east coast travel, I bounced the idea for my T**x talk in Puerto Rico off of a number of people. This was one where I compared the parts of my schooling where I vividly remembered teachers and classes, vs the parts where there are blank spots. On the drive from my sister’s house to State College, PA, my long time friend Kevin gave me several quotable nuggets, especially “Be humbled by the fact we will know know at the time what might become memorable.” His perspective was especially important, because we went to high school together. While planning the talk I felt like I was missing the factor in stories I credit to Darren Kuropatwa, the “So What”… until I got it from meeting Amy Collier for coffee in Middlebury, Vermont. Amy Collier is someone I have read, followed passed by in twitter a while, met briefly at #et4online in Dallas, April 2015. Knowing that she was just into a new exciting role at Middlebury College, where I was visiting anyhow to visit Barbara Ganley and Bryan Alexander, the timing worked well to meet before she flew out for #dlrn. The conversation with Amy opened up everything in terms of the next A. After describing the flow of my talk, likely only semi-coherently, she asked me if I knew of “the paper about Miss A”. She described it as a research study that tracked long terms students of a certain first grade teacher who had a significant impact on their later life success. She told me the author was “Pederson with a d”. That’s what I had – a paper about Miss A authored by someone named “Pederson”. 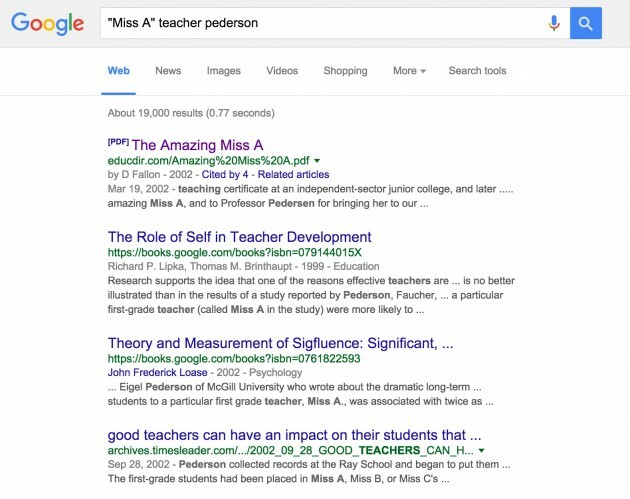 Now we pretty much web search without thinking it’s special; google is now a verb… but frankly, jist stop to take in stride that I can type "Miss A" teacher Pederson in a box, and in seconds get these results… well, that’s Amazing. The first result is not the Amazing paper, but is part of the path to get there. 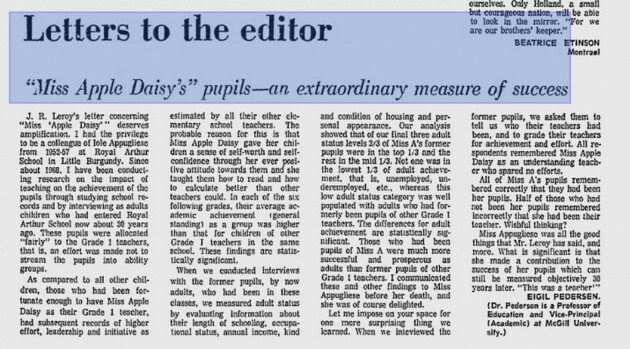 The Amazing Miss A – And Why We Should Care About Her (a PDF) is the transcript of a 2002 talk by Daniel Fallon who was then Chair of the Education Division of the Carnegie Corporation of New York. Professor Eigil Pedersen is the senior author of the lead article in the Harvard Educational Review from the issue of February 1978. He had already been Provost for six years at the time the article appeared, so it is all the more remarkable for having been completed while the author was laden with heavy administrative responsibility. Although the editors of the journal saw the obvious significance of the study, it was nonetheless largely ignored because it ran against the prevailing orthodoxy of the time. A few discerning scholars, however, were impressed with the elegance of its writing and the exceptional genius of its scholarship. Therefore, since its appearance it has been assigned occasionally in graduate seminars along with other articles, which is how I found it last year. Current cutting-edge research has now validated Pedersen’s essential findings, making his contribution of high importance today, more than 23 years after its publication. This first finding was important, because it is, as you will so, the only fully open summary of Pederson’s research available at http://educdir.com/Amazing%20Miss%20A.pdf. Just for interest, the web server this is on belongs to Educational Directions, some kind of educational and advising service in South Carolina. Why this PDF is here, who knows? Someone uploaded it. Pedersen, E., Faucher, T. A., & Eaton, W. W. (1978). A new perspective on the effects of first-grade teachers on children’s subsequent adult status. Harvard Educational Review, 48(1), 1-31. In this article Eigil Pedersen, Thérèse Annette Faucher, and William W. Eaton have taken on one of the most difficult questions in educational research: the impact of the classroom teacher on children’s adult status. The authors detail the results of a research project of unconventional methodology and Unusually long duration. They sought originally to examine atypical IQ changes but came to focus on the enduring effects of one remarkable first-grade teacher. Drawing upon the idea of the “self-fulfilling prophecy,” the authors relate the effects of teachers’ attitudes and resultant behavior to the subsequent adult status of sixty children. Their conclusion, in contrast to that of many recent studies, is that the classroom teacher may have a significant effect on children’s chances for success in later life. This is definitely gold for my talk. You need a HER subscription, or maybe be associated with a Library that does. Now I did not actually check, but the price to buy this article is not outrageous, $9.95. But this paper, described by Fallon, “Current cutting-edge research has now validated Pedersen’s essential findings, making his contribution of high importance today” is 37 years old, and is still tucked inside a paywall. At Harvard, who has the largest endowment in the USA, one that at $36 billon exceeds the GDB of half the countries around the world. At Harvard, who offers classes for free. I was looking at the paywall. And decided to breach it, by asking A [unnamed] Librarian for help getting the paper. And this Angel slipped me a PDF. I dove into the paper. Looking at my highlights, I might have done better to highlight the unimportant parts. I am going to try and do my own summary here, with what I found Amazing — first conforming what experience suggests- a caring first teacher who sets expectations for learning, has a profound impact on students far down the road; but it’s not the only affect. Second, this is what I learned (from listening a later talk by Amy) is (I think) Participatory Action Research. Pederson was not a removed neutral entity; he had a direct, personal stake in the subject he studied. This research mattered to him, personally and professionally. Third, the research approach changed in the middle, because of what they found as a more appropriate measure than what they set out to do. Fourth, while research methods is not my forte, from what I read the authors went to extraordinary ends and rationale design to address possible shortcomings. Situated in one of the poorest areas of the city, the fifty-year-old building that housed its students stood out like a fortress in the streets. During the period when the subjects attended Ray, freight terminals of a large railway, as well as a steel-fabrication plant, were located in its immediate neighborhood, and most of the pupils had to cross at least one major traffic artery to get to the school. Across the street from the front entrance, the buildings of a brothel, thinly disguised as residences, blocked the view of a junkyard. Crowded tenement houses were interspersed with an automobile repair shop, a dry-cleaning plant, and an armature-wiring factory. The asphalt schoolyard was enclosed by a chain-link fence and the ground-floor windows were protected with vertical iron bars. Sadly as a sign of the times, the students are described as one third being “Black children” while the rest are “Mainly Anglo Saxon in origin” — when was a group of students ever described as “White children” vs “mainly African in origin”?? Ray was a “difficult” school; IQ scores were lower than elsewhere in the district; half of the students who went on did not finish 10th grade, and only 10% graduated high school. Then we find that the the school was not just randomly chosen because it met some research standard needs. By every standard our research has proceeded in a most atypical fashion. First, one of the authors [Pederson] has been personally involved with the research setting since the age of four, initially as a pupil and later as a teacher. Pederson was one of those 10th grade dropouts, becoming an apprentice, but later earning a high school equivalency and a teaching certificate from a junior college, and returned to Ray as a 5th grade teacher. He was disillusioned at how many students he taught failed the first year of high school and not complete high school. He thought if he could interview graduates of the Ray school as young adults they might be able to give him valuable information about their experience as elementary school pupils, and this might help him devise more effective teaching strategies at the school. So, he began reviewing the permanent record cards pupils had acquired while they were in elementary school to find addresses to try and locate the students. It was about finding the addresses of former students. These hand written record cords meticulously recorded not only student progress, test scores, but also demographic information. While reviewing the cards, Pederson noted some unusually large changes in IQ tests between 3rd and 6th grades. Conventional wisdom was that IQ scores are innate and should not change by margins as high as 30 points. Because all social research should have well-defined boundaries, it was necessary to decide which factors to study. For years the author had been critical of the amount of time and effort invested in the discovery of unalterably gloomy facts associated with the high drop-out rate of disadvantaged pupils. 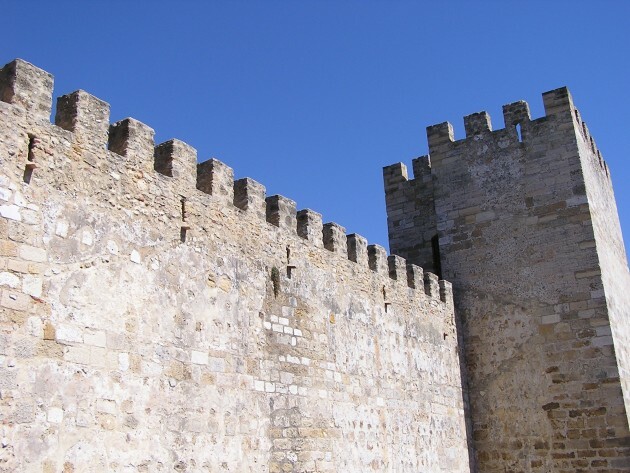 While recognizing the importance of the pursuit of knowledge for its own sake, he decided to concentrate on some aspects of the problem that might be subject to change as a result of intervention. The research, in other words, was intended not simply to explain failure, but to produce findings that might lead to improvements of the academic performance of future students. The first stage of the research dealt with sampling issues, gender differences, and five hypotheses that might explain the observed changes in IQ scores between 3rd and 6th grades. They looked at home environment factors, teacher expectations, possible influence of previous teacher observations, teacher comments/feedback to students, etc. children of substantially similar backgrounds who were assigned to different teachers exhibited different levels of success. We believe that some teachers are more positive in their attitude toward children and are, perhaps, better teachers. If children are fortunate enough to begin their schooling with an optimistic teacher who expects them to do well and who teaches them the basic skills needed for further academic success, they are likely to perform better than those exposed to a teacher who conveys a discouraging, self-defeating outlook. So early teachers have a strong influence. And in the middle of this research, the authors decided to shift the focus from tracking IQ scores, to doing what Pederson thought of as a teacher in Ray. They would interview former students who were adults, and use some measures to come up with a measure of “life success”. Again the paper describes in detail how they developed a ranking criteria based on multiple factors- job types, status of the home, extended family, some observations of the quality of home life. The interviews also included questions of the subjects memory and judgment of effectiveness of their first grade teachers. Or, as I tried to do in my talk, they were looking to find whether these first grade teachers were memorable to their students later in life. There three teachers who taught at Ray over a long time period that was part of the study, identified as Miss A, Miss B, and Miss C. What they found was surprising- the students who had Miss A showed a significantly higher life success (by the scale of their interview measure) than all other teachers combined. Table 7B shows that Miss A’s superiority as a teacher, inferred from her reputation, to be described later, seems to have some relationship to the subsequent performance of her pupils. For example, two-thirds of her pupils achieved the highest adult status, compared to less than half that proportion for the former pupils of the other first-grade teach- ers. None of Miss A’s pupils was in the lowest status category, but more than a third of other respondents had this unhappy experience. These findings are so dramatic that one might suspect the results are spurious. The others shared the results, compiled suggested reasons for the variance, and were able to support the results statistically including “modified stepwise-multiple-regression analysis” of other factors. Thus the question became- what was Miss A doing that made such a difference in her students (Pederson was a student of Miss B)? Unfortunately, the research took so long, into the early 1970s, that by the time they were ready to interview Miss A, she was in the last stages of a terminal illness. They did talk to her colleagues and former students. The amount or memorability that these adults had of their first grade teacher was the thing I was looking for. Not only did Miss A have a good repu- tation as a teacher in Ray School, but she was still remembered by the individuals we interviewed about a quarter of a century after they had been her students. Many of the subjects could not remember the names of their teachers, and sometimes their memories were actually wrong, as we discovered when comparing their recollections with information on the permanent record cards. Despite the general difficulty of remembering every teacher, not a single subject who had been in Miss A’s class failed to recall that fact correctly. Of those who had not been Miss A’s pupils in first grade, 31 percent had no recollection of who their teacher had been, fewer than half identified their first-grade teacher correctly, and four subjects incorrectly named Miss A as their teacher. Memory seems to have been influenced by wishful thinking! Students who did not have Miss A as a teacher (according to the school records) later in life had inserted the memory that she was their teacher. She set high expectations for her students- that all of her 1st grade students would read by the end of the year. If students forgot or lacked lunches, Miss A would share her own lunch with them. The researchers did not just assert the conclusions, they dealt with and rejected possible criticisms such as school records showing success might be because she was an easy grader. It is worth considering the possibility that Miss A’s reputation might have had some impact on the marks given by the second-grade teachers, insofar as they would tend to be aware of which children had been with Miss A, and which had come from other classes. The last part of the paper is some kind of statistical “path analysis” I don’t full understand. In the conclusion, the authors do stress that Miss A’s influence was significant, but not the only factor in students achieving academic and later life success, that it is both nature and nurture. …we recognize, and our path analysis reveals, the importance of family characteristics for adult status. We do not dispute the fact that, regardless of teacher quality, children from privileged background are more likely to achieve high adult status than children from disadvantaged backgrounds. But our research does show that the teacher can make a difference, not only to pupils’ lives in schools but to their future as well. In the meantime, teachers currently at work should not accept too readily the frequent assertion that their efforts make no long-term difference to the future success of their pupils. While we must not return to the unreasonably inflated expectations for public education of the last decade, we must also not dismiss the likelihood that teachers’ best efforts may have positive long-range results. To do less may destroy teachers’ morale and minimize their importance, as significant others, to their pupils. My experience shared in my talk, the influence of some rather small things like a “check plus fantastic” in second grade, and a series of teachers that set both high expectations and offered encouragement, seemed to have an influence on me. But I am but one data point. Still, this paper did so much to find that pivot for the end of my talk — and whether you have doubts of the research or applicability/generalization of one teacher’s impact– my teacher’s memorability feels profound (several colleagues, successful in their own right, report that they have very little memory of their early teachers). The paper does register some 178 citation links in Google Scholar. 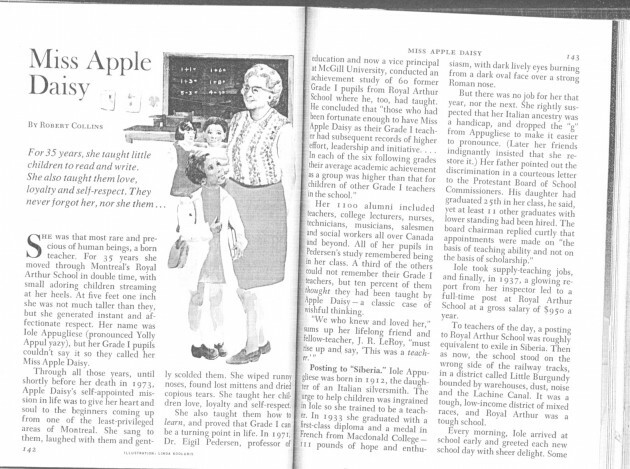 We find the name of the school and that Miss A’s name was Iole Appugliese, but she was known as “Miss Apple Daisy”. There is also a tribute to her on a Great Montrealers site. Collins,R. Miss Apple Daisy. Reader’s Digest (Canadian Edition), September 1976, pp. 142-147. As it turns out the Reader’s Digest Canadian Edition is not easy to find online. Or anywhere. So I turned to twitter. @monicarettig @cogdog I'll put an inter library loan request tomorrow. We'll see what the internet can come with until then. @cogdog I put in a request for it. We'll see if it works. @cogdog I checked the SFU library, but nada. @cogdog Only have 1985 onward at MPOW, but looks like it is available at Toronto Reference Library. Still need it? I sent Sally a DM asking for an address so I could mail her some appreciation- Librarians RULE! No appreciation required. As a Canadian librarian I had to rise to the challenge. It was buried in the closed stacks at the Toronto Reference Library. I am going to post it here, copyright be damned! Thanks to anyone who made it to the end of the post. I wish I had a prize, the best is the story of what Sally Wilson did for me to find this article, showing the chaotic, loosely connected way the web works– the open one where information is not completely hidden in stacks or paywalls. And thanks to Eigil Pederson for such a monumental piece of research, the kind I am not sure still happens. And thanks to Amy Collier for pointing me this way. Cool! One of those great interwebz shaggy dog stories. Twisty, twisty, fun, fun, fun. His Place- Who Was Clarence H. Shaw?